Converse is one of the oldest market leaders in footwear industry. As the American brand is all up to spread its wings across the globe, we bring in the different kinds of converse shoes available. Converse has really come a long way from the Massachusetts-based rubber shoe making company in the early days to be one of the world’s most famous brands. Converse through the years has risen from being a small time business to a global brand name. All thanks to the introduction of all star basketball shoes in 1917 that revolutionized the company. Chuck Taylor, who is a household name today, joined Converse in 1921 and continued to serve the company till 1968, after spearheading the company’s campaigns, which saw Converse become the largest sneaker manufacturer in US, with a market share of over 80%. Though with the Second World War, Converse also diversified into military shoes and stuff, the sneakers and sports shoe business was its stronghold. It continued to rule the national scene up until 1970s, when companies like Puma, Adidas, Nike and Reebok entered the fray. 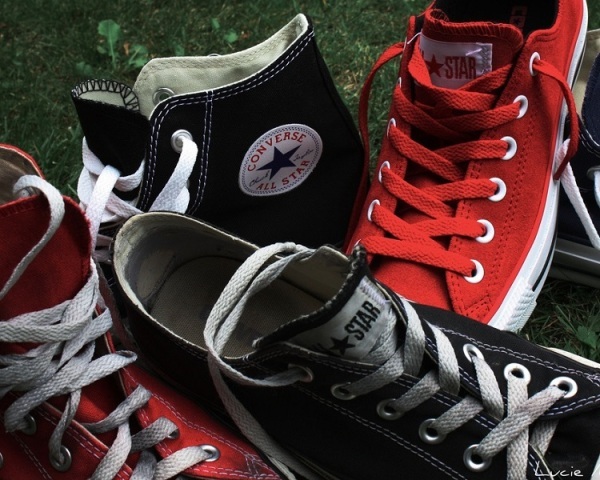 The situation hit the low point when Converse had to file for bankruptcy in 2001. However despite a series of financial scuffles, Converse, today a part of the Nike stable, has outgrown its domestic market and spread worldwide. Nike has moved the production and distribution of converse shoes to international areas. In the following lines, we have introduced the various Converse models, so that you can make up you mind before buying. The signature brand from Converse was launched in 1917, but the name was just Converse ‘All Star’ basketball shoes. It was a smart design with canvas being used as the material. The shoe was a mediocre hit initially. It was after the association of a young basketball player Chuck Taylor that the company really took off. With Chuck’s inputs, the shoes were modified a bit. Impressed by the results, Chuck himself became the leading salesman of the brand. With his charm, charisma and great design factors, the ‘All Star’ model became the choice of every basketballer. Chuck Taylor’s signature was added to the ankle ‘All Star’ patch in 1923, and has continued ever since then. The shoe was modified in many ways with low top and knee length version also coming in, but the most popular is still the old canvas in black, with ‘All Star’ high at top. Though the shoes are seldom used as sports shoe today; they have gained an iconic status in style and fashion industry. Worn by millions around the world; ‘All Star’ is synonymous with Converse and rock music in many parts of the world. Former world badminton champion, Jack Purcell designed a canvas and rubber badminton sneaker, for the B.F. Goodrich Company of Canada, in 1935. The aim was to provide more protection and support for the feet on badminton courts. In the 1970s, Converse purchased the trademark rights to produce Jack Purcell sneakers, which is still in production today. The sneakers are similar in appearance to Converse's Chuck Taylor ‘All-Stars’, but can be distinguished by the signature "smile" across the toe. Converse "Jack Purcells" are still popular, but more for their vintage fashion appeal, than athletic use. John Varvatos is an American contemporary high fashion menswear designer from Detroit, Michigan. In 2001, John was licensed to create a line of high-end Converse ‘All-Star’ shoes for the fall/winter season that year. The designs were so popular that they have continued to acquire his talents to this day. His designs are used for the younger, edgier John Varvatos USA collection. It contains some very premium shoes and designer models. Starting in 2008, Converse collaborated with Target to produce the Converse ‘One Star’ range. This venture resulted not only in the production of footwear, but also apparels. The ‘One Star’ is available very cheaply as compared to ‘All Star’ and other collections. A genuine complaint is the lower quality of materials used in ‘One Star’ which makes it cheaper to sell. Apart from these main versions, Converse provides many more design lines. Some of them are limited addition, while others have been there for years. There are few lines of converse shoes like skate and sports authentics that have products that lie in different lines or crossbreds. Recently, Converse launched a vintage collection too.